In Texas Hold’em, there are 169 unique combinations of preflop starting hands you can be dealt. This number is arrived at by grouping holdings into pairs, suited cards and offsuit cards, and considering that preflop specific suits (e.g. hearts vs diamonds) don’t yet have value. Of the 169 unique holding, many will advise beginners to stick to roughly the strongest ten percent. This range would include the top 10 starting hands, plus around a dozen more combinations. Equity calculation tools like PokerStove and Equilab define the top 10% as 77+, QTs+, and KQo+. Meaning pairs Sevens and higher, suited connectors Queen Ten and higher, and unsuited connectors KQ and higher. Ace Nine being the lowest suited ace to play, and Ace Jack the lowest offsuit. A total of 22 possible combinations. AA – The best starting hand in holdem. Playable from any position. KK – The second best starting hand. Holds roughly 70% equity versus any ace. QQ – Great strength preflop but becomes difficult to play post-flop when overcards hit. AKs – This is the fourth strongest starting hand, and the strongest unpaired holding. Even against KK, this hand holds 34% equity – and is a coinflip versus pairs, and significant favorite against the rest. AQs – Strong yet easily dominated or flipping in typical all-in preflop scenarios. JJ – Many claim jacks to be the most difficult top 10 starting hand to play. While being the fourth best starting hand, JJ versus AA-QQ and AKo-AQs is a 38% underdog. KQs – 63% vs two-random cards. While this hand is best suited to make straights and flushes, it can put you in difficult positions when flopping top pair, as you will never have the best kicker. AJs – Difficult to play from early position because you will never get folds from better aces, and you won’t get fat value from top pair. Has value in its ability to make the nut straight and flush. AKo – The strongest unsuited, non-pair. This hand is easy to overplay and over value when you are deep in tournaments and in cash games. Against the above hands (top 3%), AKo holds 47% equity. TT – Extremely strong vs two random cards (75%) yet difficult to play, similar to JJ. 99 – 72% equity vs two random cards. However, against the top 5% of hands, 99 is a 2:1 underdog. 88/77 – 70% vs random cards and ~30% against higher ranked hands. Difficult to play post-flop. AQo – Openable from any position but be wary when facing a 3bet, especially out of position. ATs – Playable from middle and late positions. AJo – Difficult to play from early position and when facing 3bets. KJs – Tricky hand when you make pairs but has strong drawing potential. KQo – Should technically be folded from early position. Can raise from middle and late positions. KTs/QJs/QTs – These should be played in position and when getting correct odds, as they are good drawing hands but weak when pairs are made. The top ten percent of starting hands serves as a basic chart for profitable hole cards; however, the most important use of this list may be to assign specific ranges to your opponents’ tendencies. Once you know what ten-percent looks like, you will be able to recognize what 3% looks like and 20%. If the tightest player at the table raises under-the-gun, you can probably assign him 3.5% of starting hands. When the most aggressive maniac at your table opens when folded to him on the button, you can assume they’re opening almost any two cards. 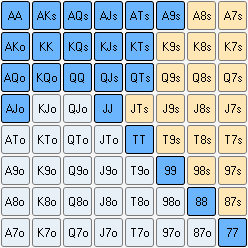 VPIP: This is how often your opponent is voluntarily putting chips in play (not including the blinds). 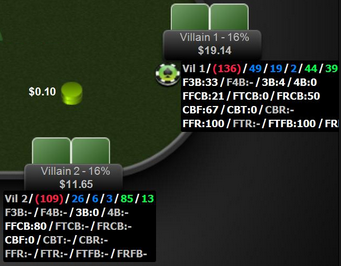 PFR: How often your opponent raises preflop. 3B: How often your opponent re-raises (3-bets) other players’ preflop raises. Playing around with your HUD you can add a whole host more, from no. of hands you have on a player, to their fold to continuation bet percentage, or display those in a pop up window when you click on a player. If you saw a basic HUD read: 10/8/4 you would understand that your opponent is playing 10% of their hands voluntarily, raising 8% of them preflop, and 3-betting preflop 4% of the time. At a glance this is a tight-aggressive player. • 10% of hands preflop. Roughly 77+, ATo+, A9s, almost all Broadway (A-K-Q-J-T) cards. • 8% raising preflop would indicate 88+, and most suited Broadway cards. • 4% re-raising / 3-betting which stands as 99+, and AKs, AKo and AQs. While helpful, it is important to be wary of the assumptions made by these statistics. Although it may be unlikely that a player 3-betting just 4% of the time is ever bluffing, the 4% is only relevant to the frequency of that play and not directly the top % range of cards. Their 4% may include random tilt plays.